Every season, there's a color: A color that's all over the runways and that I pin and pin obsessively. This season, that color is cobalt blue. I can't get enough of it. I love it for being so rich and bold, but I also love it because it literally looks good on everyone. Pale skin, olive skin, dark skin--I dare you to show me someone who doesn't look pretty in a richly pigmented royal blue. 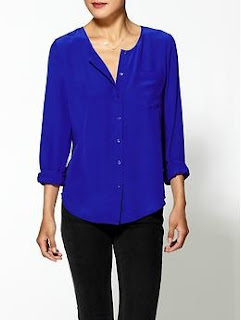 Tinley Road Silk Blouse at Piperlime.com. 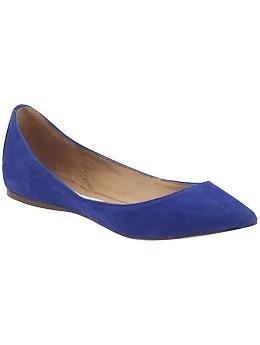 Steve Madden Vegass shoe at Piperlime.com. Accordion Pleat Skit at Bananarepublic.com. 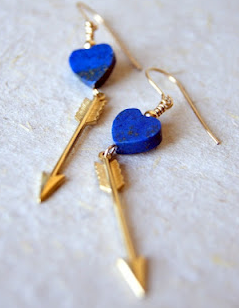 Heart and arrow earrings at Etsy.com. Looking for more summer brights? I have those shoes only with added "bling"
My favorite color to wear!!!!!!! I'm glad I dropped by today and caught up with months of your posts. Keep the blog going, you are an inspiration! Thank you so much for your heartfelt comment on my blog. I really needed to hear that today! I love your blog over here, your message and your story. It is all spectacular. Kudos to you for everything you are standing for!!! Now following your twitter, xo! !